Part two of last year’s travels. I eventually reached the big X in the sky but there is still a long way to go. The days were long and would seem lonely. But they were a sort of meditation. I had traveled most of this route to the west at various times before. Revisiting and rethinking were in order. Shuffle off to Buffalo and places beyond. Day two on the road. X marks the spot. 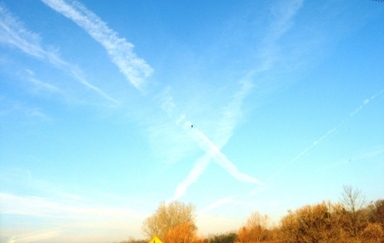 Whether they are contrails or chem trails we won’t discuss here, but I am headed out towards the big X in the sky. The geese don’t need a marker. They know where they are going. Shifting, dancing, flowing through the air they create lines, arrows and wedges as they trade places on their trip. I head straight down the highway, straight west. What is that big X? Does it mean the sky is the limit? That’s a great picture! Thank you for deciding to repost these from your trek to the west – I am enjoying following you this time, since I didn’t know you before and was actually not even reading blogs just a year ago! on March 15, 2011 at 10:58 am Penelope J. Beautiful picture and your writing is gorgeous. Also glad you decided to repost. About the X, they must have been the trails of two of those supersonic jet fighters that fly so high and fast that you can’t see them, but they weave across each other and leave that kind of mark in the sky. I learned that when I was living in Santa Fe, NM and would see them all the time.